Cool.Club Blog is a trustworthy resource for writers. It contains information that’s going to be helpful both for beginners and experienced writers. Cool.Club Blog has over 40 articles on topics, such as copywriting, productivity, and time management. Each day, the blog is filled with new materials that will teach writers to optimize their time and focus on their primary tasks. 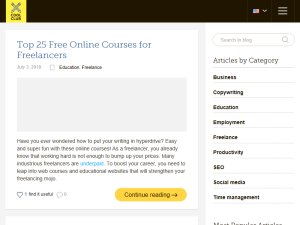 This what your Freelance Writing Blog Blog Ad will look like to visitors! Of course you will want to use keywords and ad targeting to get the most out of your ad campaign! So purchase an ad space today before there all gone! If you are the owner of Freelance Writing Blog, or someone who enjoys this blog why not upgrade it to a Featured Listing or Permanent Listing?